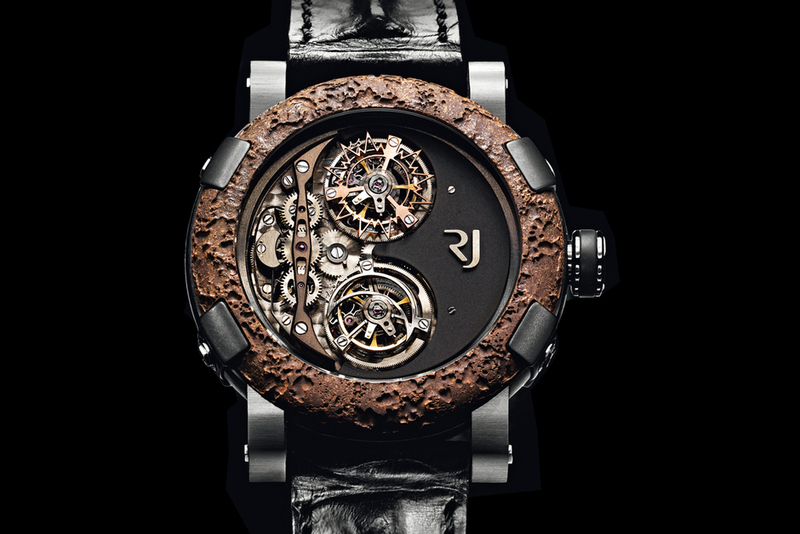 Back in 2008, the famous Swiss watchmaker Romain Jerome launched its highly innovative Day and Night Tourbillon watch. It didn’t take much for this controversial timepiece of radical design to capture the media’s attention – as the watch that didn’t tell time. Traditionally, watchmaking companies are showing their skill and expertise by making ultra-complicated watches, equipped with special features that go as much beyond the simple display of hours and minutes as it is possible to achieve. However, the relatively young independent watch brand went in a surprising new direction, and stripped its Day and Night model even from its basic time-telling functions. Instead, Romain Jerome Day and Night watch features two tourbillon cages: one that turns only during the AM hours, and the other that rotates during PM hours. This whimsical creation had only one purpose – to offer a completely new way of measuring time, by splitting the time continuum into two mutually complementing, and yet opposing elements: day and night. Avant-garde in both design and concept, Romain Jerome Day and Night watch facilitates this new interpretation of time via two mechanical tourbillons that operate in fixed sequences. The Day Tourbillon, which is made of red gold, operates only during the day and stops after twelve hours to entrust its function to the Night Tourbillon, which is nestled in a steel carriage. Each of them symbolizes one of the opposing spheres of the wearer’s activity: the daytime, during which things are happening or being done, and the nighttime, which is the wearer’s private time. Despite of its astronomical price of $300,000, and its utter uselessness, this amazing vanity piece was sold out within 48 hours. The success has motivated Romain Jerome to create a sequel to its Day and Night watch, the Romain Jerome Titanic DNA Day & Night Spiral, which was unveiled on the occasion of the BaselWorld 2009 exhibition. Just like its Titanic-inspired predecessor, the new Titanic DNA Day & Night Spiral, is designed in the spirit of Steampunk aesthetics. However, this time it came with a practical innovation – an off-centered hours and minutes counter, to make the time instantly and handily available. Both Day and Night models are housed in 46 mm case made of black PVD-coated steel. Each features an oxidized steel bezel, which blends genuine steel from the Titanic wreck, lying 3,840 meters below the ocean, and steel provided by the Harland & Wolff shipyard in Belfast, a heavy industrial company that built the famous British passenger liner. For both of these models, the mechanical winding movement Sequential Double Tourbillon Spiral with differential, was built by BNB Concepts. The movement is partially revealed through the semi-skeletonized dial, whose solid segment is made of deep black coal, which was also recovered from Titanic. Both models were available in limited editions of 9 pieces, and they are both sold out.